Alabama Athletics is committed to providing the highest quality game-day experience for everyone attending an event at Bryant-Denny Stadium. Every renovation or expansion of Bryant-Denny has provided additional opportunities for an enhanced game-day experience. 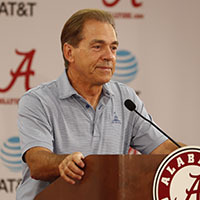 Bryant-Denny Stadium is one of the most iconic facilities on The University of Alabama campus and, as such, will be among the featured capital projects in The Crimson Standard.